On March 4, when receiving in audience the Superiors, dependents and collaborators of the Vatican Secret Archive, the Holy Father Francis expressed his decision to open to qualified researchers on March 2, 2020, the Holy See’s Archives for the entire period of Pius XII’s pontificate (March 2, 1939 – October 9, 1958), an announcement awaited for some time by the scholarly world and coinciding with the 80 years of the election of Cardinal Eugenio Pacelli to the Throne of Peter. Obviously, Pope Francis’ important initiative has behind it a long period of preparation, during which the archivists of the Vatican Secret Archive and their colleagues of other Vatican Archives have carried out a patient endeavour of ordering, counting and inventory of very many funds and documents concerning Pius XII’s pontificate. Since December 2002, Pope Saint John Paul II, sensitive to the requests that came to him from various places to obtain the possibility to investigate the Holy See’s documents relating to the period between the two World Wars, decided to make accessible some funds of the Vatican Secret Archive, still belonging to the so-called “closed period,” in view of a future opening of Pius XII’s pontificate: Archive of the Apostolic Nunciature of Monaco of Bavaria (1922-1934); Archive of the Apostolic Nunciature of Berlin (1922-1930). Rendered consultable at the same time were the following Archives and Funds: Archive of the Secretariat of State, Section of Relations with States (then Extraordinary Ecclesiastical Affairs), Bavaria (1922-1939) and Germany (1922-1939); Archive of the Congregation for the Doctrine of the Faith, documents relating to the condemnation of Communism and of National Socialism. On June 8, 2004, Pope John Paul II himself, always in view of anticipating progressive limited openings, homogeneous in filing and autonomous in themselves, made available to researchers the Vatican Archive’s ample fund of the Vatican Office of Information for prisoners of war (1939-1947). Made up of 2,349 archival units, subdivided in 556 envelops, 108 registers and1,685 boxes of documentation, with alphabetical filing, which amounts to close to two million 100,000 name records, regarding military and civilian prisoners, missing or interned, of whom news was sought. A fund immediately investigated and still today greatly requested by private scholars and relatives of the deceased prisoners. On June 30, 2006, Pope Benedict XVI decided to open the whole of Pius XI’s pontificate (1922-1939), which was carried out on September of that year, at the autumn opening of the Vatican Archive. On that occasion the Vatican Archive could be consulted, be it the great fund of the first Section of the Secretariat of State (General Affairs), be it the Second Section, Relations with States (then Extraordinary Ecclesiastical Affairs). From 2011, this last archive has been given autonomous classification. While Pius XI’s pontificate was being opened, there was already work in the Vatican Archive for the progressive preparation of Pius XII’s documentary material, which not a few scholars were requesting with ever greater insistence. The amount of work was certainly heavy and only in 2008 Father Federico Lombardi, SJ, Director of the Holy See Press Office said, in the pages of the “Corriere della Sera” of October 31, that thought could be given to a hypothetical opening of Pacelli’s pontificate ‘within 6-7 years,” or around 2014/2015. It was too optimistic. The work of preparation of the enormous documentation, as well as the limited strength of the Vatican archivists, postponed until today, for objective reasons, the awaited opening. Finally, in the brief course of about 13 years, which truly doesn’t seem too long a time for those involved in archival work, the Holy Father Francis made the decision, fully aware of all the steps carried out, which will have its practical implementation on March 2, 2020. Following this papal deliberation to open the archives up to October 1958, <it was decided> to open in March 2020 the Vatican Secret Archive, the Historical Archive of the Section of Relations with States of the Secretariat of State, the Historical Archive of the Congregation for the Doctrine of the Faith, the Historical Archive of the Congregation for the Evangelization of Peoples, the Historical Archive of the Congregation for the Oriental Churches, the Archive of the Fabbrica of Saint Peter and, according to different ways and forms of access, also other Historical Archives of Congregations, Dicasteries, Offices and Tribunals at the discretion of the Superiors concerned. Each of these important Archives has its own regulation, booking system and, naturally, Indexes and inventories regarding their documentation, which is now available. I limit myself, for obvious reasons of competence, to make a brief review of the not few sources of the Vatican Secret Archive regarding the recent opening, also because this Archive — analogatum princeps of the other archives of the Curia –will probably be very much the first to receive requests on the part of its present users (around 60 daily presences) and of future researchers of Pope Pacelli’s time. Then I think it useful to recall that since March 2000 the archive of Vatican Council II can be consulted in the Vatican Secret Archive (a total of 2,001 envelops): almost finished is a full-bodied, precise and detailed Inventory of the Archive (available also in digital format) edited by Dr Piero Doria. Conclave-Election-Coronation, Papal Acts, Encyclicals, Motu Propri, Chirographs, Apostolic Letters, Greetings and Tributes, Autograph Blessings. Gifts, Inheritance and Legacies. Papal Family (Death and funerals); Catholic Associations; Cardinals (Consistories, Protectorates, Special Commissions, Sacred College); Churches and Clergy, Roman Curia (very diverse materials e.g. the Holy Father’s trips, Doctors of the Church, Requests for Beatifications and Canonizations, small offerings, sending of tribute publications. Passports, typography, free customs, etc. ); Dioceses (A-Z)’ Episcopate in general; Missions; Women’s Religious Orders, Men’s Religious Orders; Populations; Patriarchs, Archbishops and Bishops; Seminaries and Universities; Solemnities and Congresses; States; Vatican City State, and other titles. Written on all this documentation are precise computer descriptions of the respective dossiers, which researchers will find in the Study Hall also in paper form (a good 68 volumes of Indexes). Beyond the ordinary sources of the Secretariat of State the so-called “separate envelops” for the whole of Pius XII’s pontificate will be available, which preserve documentation for individual topics or institutions, always organized by the Secretariat of State itself, for example” Extraordinary Missions, Suppressed Congregations, Roman Curia, Consistories, Prelatures, Protectorates, Papal Armed Corps, Diplomatic Corps, Princes and Royals, Official Visits of Heads of State, House of Savoy funerals, Rosa d’Oro, etc.) A total of 538 envelops, of which there will be a precise descriptive list. Coming from the same Secretariat of State are the 76 units now called Pius XII Paper, which contain manuscripts of Eugenio Pacelli before his pontificate and then during it, as well as typewritten <versions> of his many addresses, sometimes with autograph corrections. Many of these addresses have already been published. An analytical Inventory of this series will be available. Following then are three considerable sources, always internal to the activity of the Secretariat of State, but each one constituting a ‘special” archive. 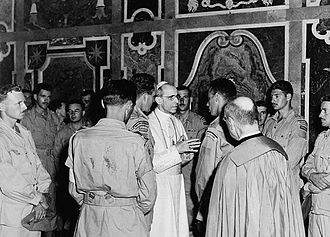 Several officials appear of the Secretariat of State but outstanding as giants are two figures: Pius XII and young Giovanni Battista Montini, through whose tireless hands, organ of his delicate heart and his human sensibility, thousands of charitable practices passed. The first is designated as Relief Commission, instituted by Pius XII in 1939 (however, it’s more organized activity dates from 1941), which looked after the charitable interventions in the various prison camps, through the Nuncios and Apostolic Delegates, as well as Bishops, for the relief of prisoners’ needs with food parcels, garments and also money; it also fostered radio communications to intensify the exchange of information about the wounded, the prisoners, the hospitals, whereas in the post-War it was concerned with the repatriation of the wounded and mutilated, with the exchange of prisoners, assistance to the veterans and refugees. The source is articulated according to the designations given at the time to the series of writings, or Italians, Foreigners, Race, Various, 1949, 1950, for a total of 586 boxes. Researchers will be able to make use of a precise printed inventory (in the series Vatican Archives Collection), preceded by a history of this office, looked after by archivist Drs Francesca Di Giovanni and Giuseppina Roselli, entitled Archive of the Relief Commission (1939-1958). Inventory (in two volumes). Among the innumerable papal charitable practices I highlight that related to the subsidies offered to emigrants in Argentina and Brazil (1940-1941), the transport of grain in Greece requested by Monsignor Roncalli (1941), the aid sent to civilians in Poland (1943), the “discovery” of the Fosse Ardeatine, the economic aid offered to families victims of the bombardments of Rome in 1943, and the reconstruction of the Abbey of Montecassino (1946-1948), support of Italians of Venezia Giulia and of Istria in the sad vicissitudes of the Eastern border with Yugoslavia (1945-1948), the interest in favour of Basque Catholics condemned to death in Spain in 1946, to Pius XII’s help given to a groups of Russian scientists in exile in Austria in 1946. The Relief Commission must not be confused with the Vatican Information Office for prisoners of war. The second “special” archive is simply called Papal Charity. It also has some officials of the Secretariat of State in charge of following the Pope’s charitable practices and over the years it developed a notable archive, all the more conspicuous in as much as the activity continued also after the War, up to the pontificate of Paul VI when, in 1968, this activity also passed to the new entity called “The Holy Father’s Welfare Service,” today included in the Apostolic Almonry. This archive, which raises with its minute papers a true monument to Pope Pacelli’s truly heroic charity, has 2,394 envelops that cover the years 1939-1968 (which could obviously be consulted only up to 1958), subdivided in four series: I: General and Private Protocols; II: Italian Dioceses; III: Rome; IV: Associations, Churches, Commissions, Roman Curia, Italian Dioceses (in general), Foreign Dioceses. The fund has an Inventory available either in paper or computer form, and a general alphabetical file (according to the names of the beneficiaries, whether individuals, institutes or institutions) which has close to 188,000 files, which can be consulted today on the Internet network of the Vatican Archive, reproduced in all its parts. In the series I (Individuals, envelops 1-1,136) we have the practices relating to the enlargement of subsidies to private persons for very varied needs. The frequent requests were accompanied by recommendations of Bishops, parish priests, priests, but also laymen committed in politics or in welfare associations. Very evident in one practice is the moving request for help, the particular contingencies of the person (civil or military), of the family, of the monastery, of the convent, etc. ; noted also is a certain caution of the Secretariat of State that – in keeping with a wise practice — before granting the subsidy (in money or another way) asked the closest clergy to the one making the request to verify the effective need and refer it. There was then always the precise decision of the Pope or of the Secretariat of State on the merit: donation of a sum of money (in total or partial cover — and not in a few cases ever greater — to the requests), of sacred furniture, of objects of art, even of cars, travel tickets, etc. The same can be said of series II, regarding the needs of the Italian dioceses (bb. 1.196-2,227). Systematized in series III was the documentation regarding the help given to persons or institutions (especially churches) in the diocese of Rome or its suburbs (bb. 2,228-2,331). A similar discourse is true of the IV series (Associations, etc. ), although in this case the institutions, object of the Pope’s charity, were helped especially with sums of money (bb. 2,332-2,394). The third “special” office of the Secretariat of State always desired by Pius XII after the War, in 1946, was that called the Migration Office, established to address the problems of the repatriation of different prisoners and refugees, as well as the growing migratory problem, caused by the poverty of certain European countries. The new office, which collaborated with the Consistory Congregation and the Papal Representations in the world (it has in fact the signature Congr. Conc., Emigration Office), which carried out its work until 1966. The archive produced by the Office has 69 envelops, all described in an apposite Inventory, which also has a precious index of persons’ names, places and institutions (paper and computer format). It is an enviable whole of diplomatic, religious, political and other sorts of documentation constituted by different archives of the Papal Representations in the world, which under Pius XI and Pius XII increased in number and carried out an enormous and constant activity. It must be taken into account that each one of these archives (Apostolic Delegations, Apostolic Nunciatures and Inter-Nunciatures), for Pius XII’s period alone, has an average of some 100 envelops, divided by years and by subjects and titles, Nuncio by Nuncio. We think it’s useful to list the individual archives of the Papal Representations, now reordered and described, which will be made accessible, warning that some Nunciatures’ <reports> have not yet been received for Pius XII’s years, others have given limited information to the Nuncios who followed one another during Pope Pacelli’s pontificate, some even suffered losses and war destructions and did not reach the Post-War <period>: Albania (up to 1940), Argentina (up to 1958), Australia (then Australasia up to 1948), Austria (up to 1958), Belgium (up to 1958), Bolivia (up to 1936), Brazil (up to 1946), Bulgaria (up to 1949), Canada (up to 1953) Czechoslovakia (up to 1950), Chile (up to 1953), China (up to 1946), Colombia (up to 1950). The Congo (then Belgian Congo, Rwanda, Burundi, up to 1954), Korea (up to 1957), Cuba (up to 1958), Ecuador (up to 1953), Egypt (up to 1956), Estonia (up to 1940), Ethiopia (then Italian East Africa, up to 1958) the Philippines (up to 1949), France (up to 1958), Germany (Berlin-Bonn up to 1958), Germany: III Papal Relief Mission (up to 1950). Jerusalem and Palestine (Up to 1958), Japan (up to 1948). Great Britain (up to 1958), Greece (up to 1950), India (up to 1952), Iran (then Persia, up to 1945), Ireland (up to 1948), Italy (up to 1958), Yugoslavia (up to 1952), Latvia (up to 1940), Lebanon (up to 1950), Lithuania (up to 1940), Mexico (up to 1956), Nigeria (then Africa for the Missions, up to 1946), Holland (up to 1958), Pakistan (up to 1958), Peru (up to 1953), Portugal (up to 1953), Rumania (up to 1950), Syria (up to 1953), Spain (up to 1958), the United States (up to 1958, but partial payment), United States: Yugoslavia Appendix or Hurley Paper (from 1946 to 1950), South Africa (then Southern Africa up to 1944), Switzerland (up to 1952), Thailand (then Siam, up to 1956), Turkey (up to 1944), Turkey: Greece Appendix (Paper of the Apostolic Delegate at Athens, up to 1944), Venezuela (up to 1940), Vietnam and Cambodia (then Indo-China, up to 1958). Prepared by every Papal Representation was the accurate inventory (the printed Inventory for Italy will be available in the Collection edited by Giovanni Castaldo), indispensable guide for the researcher (around 81 Indexes for a total of over 5,100 envelops). These inventories can also be consulted on the Vatican Archive’s Internet network for the ease of scholars to facilitate their research in various fields. The patient work of preparation of new means of research, as well as the ordering of the archives of the Papal Representations have been followed and led in the last years by archivist Dr Luca Carboni. To be noted is that there are other archives of the Papal Representations (about 90) still being ordered, which are being worked on with alacrity. It’s hoped that at least a part of them will be available to researchers with the next opening on March 2, 2020. In a certain sense, linked to the diplomatic documents above are, also, the papers of the Apostolic Visit in the Saar, German region under French Protectorate from 1946 to 1957. In 1948 an Apostolic Visitor was sent to the Saar in the person of Verbite Father Michael Schulien (1888-1968), who left 106 envelops of documents of his mission regarding the years 1949-1956; they are also available now through a precise Index, always in the two formats now in use. The consultation continues of the Apostolic Chancellery for the period 1939-1958 (Regesta Litterarum Apostolicarum, Epistolae Decretales, Brevia Apostolica) or documents inherent to residential Bishops, their appointment, confirmation, Titular Bishops, erection of dioceses, their eventual dismembering or suppression. A whole of some 7,700 booklets, all described in available indexes either in paper or computer format. The consultation of sources already opened up to 1939 continues also up to the death of Pius XII: Augustin Bea Papers; Serafini Papers; Soderini Clementi Papers; Congregation for the Causes of Saints (Positions or Processes); Census of the Ecclesiastical Archives of Italy already published in good part in he Vatican Archives Collection); Central Commission for Sacred Art in Italy (the Inventory has already been edited by Daniele De Marchis in the same Collections); Congregation of the Council (Disciplinary Section, Catechetical Section, Administrative Section); Consistory Congregation (Relationes Diocesium); Apostolic Datarius, Provisions; Apostolic Almonry; Epistolae ad Principes; Girolamini Fund (Blessed Pietro da Pisa); Papal Noble Guard; Palatine Guard of Honour; Prefecture of the Papal Household; Audiences; Parish Houses Papal Office; Sacred Roman Rota; Segr. State, Apostolic Briefs. Made available instead ex novo for Pius XII’s period are the following sources: Holy Year 1950 (120 units with alphabetical file); Marian Year 1954, the first of this nature in history, desired to celebrated the Centenary of the definition of the Dogma of the Immaculate Conception, opened by the Pope on December 8, 1953 at Santa Maria Maggiore and closed at Saint Peter’s on November 1, 1954 (30 envelops). Charitable and educational institution established by Pius XII in April of 1944, which carried out its activity under the name Pontifical Commission of Assistance to Refugees (PCA) and that after the War, from 1945 on had to take care of a gigantic practice of charity to prisoners, the missing, wounded orphans, families forcibly separated in need of all sorts; from 1947 on it was also occupied with the summer camps, involving a great number of volunteers among them Doctors, Sisters, chaplains, assistants. From 1953 the institution assumed the name Pontifical Relief Work (POA). It had its own juridical personality and a Statute given to it by the Holy See. This interesting archive has 1,136 full-bodied envelopes, with a precise Index in the two formats now in use. Another source opened to consultation was the National Work of Religious and Moral Assistance to Workers (O.N.A.R.M.O. ), which established itself in 1926 under the patronage of the Consistory Congregation, but whose papers reached us only for the post-War period (1952-1976), which could be consulted only up to 1958. Moreover, the Work was particularly active from 1943, very supervised by Fascism but, notwithstanding, in expansion both in the cities as well as in the countryside. The Work’s archive has 396 envelopes within which 9,500 booklets are kept relating to every aspect of the social and religious care exercised toward workers, the poorest classes, the illiterate and needy families. Among the documents of this vast important source there is a number of envelopes (59-167) in which are collected the term papers of the Higher School of Social Assistance (within the O.N.A.R.M.O), well known foundation that spread from 1945 to ’47 to many cities of Italy, which required of its students of Benevento, Parma and Rome, between the years 1952-1976, an ensemble of studies and theses geared always to social ad welfare aspects, with as many speakers, co-speakers and final exams, on the most varied arguments, whose titles and drafts had much to teach (also in terms of literacy) our Universities of today. Suffice <to mention> some titles: “Pain and Social Assistance,” “Importance of Child Nutrition,” “Juvenile Criminology,” “The Incidence of Sicknesses in Parents in Relation to the Number of Children,” “The Educational Spirit of the Church through Orphanages,” “Poliomyelitis and Its Social Importance,” and so on (there are about 9,000 term papers of these and other sorts). Just to skim the titles of the sources that will be opened for the consultation of researchers, as desired by the Holy Father, the honest reader will acknowledge that the work of preparation of so many papers, their ordering, their inventory, their careful numbering, the necessary binding are more than sufficient to give reason for the 13 years that have passed since the last opening of Pius XI’s pontificate (2006). An intense period of work to which 20 officials of the Vatican Archive dedicated themselves constantly and exclusively, helped also where possible by qualified graduates of the School of Palaeography, Diplomacy and Filing within the Archive itself. The same discourse is also true, mutatis mutandis, for the other historical archives of the Roman Curia that are now open for the Pacelli pontificate. An effort, certainly, but I think I can say a sustained effort of sure enthusiasm either because they were aware of working for future historical research in relation to a crucial period for the Church and for the world, be it because all the papers were less than asceptic. They spoke, speak and I hope will speak to researchers and to historians of an almost superhuman work of Christian “humanism” (there was talk of the “diplomacy of charity”), active in that tempestuous jumble of those events that in the mid 20th century seemed determined to annihilate the very notion of human civilization. On that sad, rather terrible scenario, be it before the last War be it during its tragic unfolding, be it after it, stands out with proper connotations the great figure of Pius XII, too superficially judged and criticized for some aspects of his pontificate, which now, thanks also to the recent opening desired with confidence by Pope Francis, I think will be able to find among the historians that know how to investigate it, now without bias, but also with the help of new documents, in all its realistic scope and richness.